Updated 25 April 2017 1700 US ET. 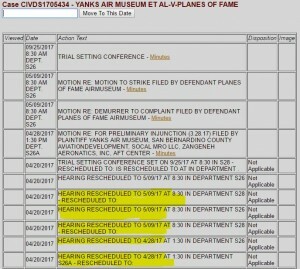 For the convenience of those following the litigation over the Chino Airshow (Yanks, et. al. 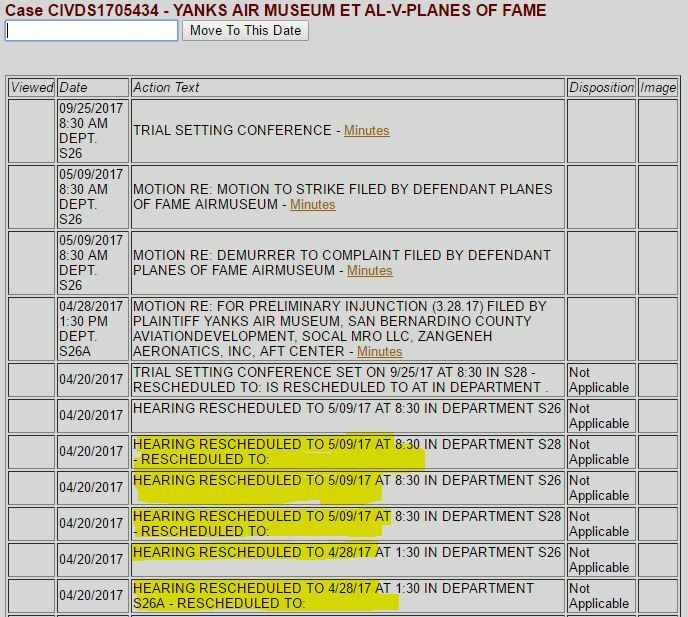 v. Planes of Fame, California Superior Court for the County of San Bernardino, Case No. CIVDS1705434), Airspeed is tracking the pleadings in the case. The plan is to update this page from time to time, workload permitting. (Like flight following through the Chicago Class B, only slightly better). What, exactly is linked here? Good question. These are the court documents, as filed in the court. A copy of the court’s docket, as it appeared at the time we downloaded the documents, leads each PDF file so that you can see the context of the documents. Most of the documents are downloaded directly from the court’s website. Several of the items were sent to us by others and we’ve posted them, having no reason to think that they’re other than true copies of the court records. We might or might not include additional documents received by this means. So here are the pleadings. They’re court documents and part of the public record. You don’t have to ask Airspeed for permission to do this or that with them. You’re welcome to do whatever is permissible to do with court pleadings. Knock yourself out. See the Ex Parte Application for Court Re-Setting Hearing Dates here. (3) PoF’s special motion to strike (what is commonly known as an “anti-SLAPP” motion designed to combat lawsuits that are intended to censor, intimidate, and/or silence opponents by burdening them with the cost and aggravation of a legal defense until they abandon their opposition) set for 13 June. This is the first time that we’ve seen the anti-SLAPP motion (filed 21 April under California Code of Civil Procedure § 425.16(b)(1), but not previously available on the court’s website), mainly because it’s attached to the 24 April application. Anti-SLAPP motions are usually used in cases that have a more clear-cut free-speech element than we see in the Chino fistfight. In the usual case, a journalist or advocate says this or that about a well-capitalized person or enterprise. The well-capitalized person or enterprise then sues the journalist or advocate for defamation without much regard for the merits of the suit. The idea of the suit is to burden the journalist or advocate with the lawsuit and try to discourage the journalist, advocate, or others from criticizing the plaintiff. A good example of a successful use of an anti-SLAPP motion is the case of Dr. Edward Tobinick’s suit against Yale Neurologist and host of The Skeptic’s Guide to the Universe Dr. Steven Novella. Novella criticized Tobinick’s claims regarding Tobinick’s Alzheimer’s treatments. Tobinick sued and Novella succeeded in fending off the suit with an anti-SLAPP motion. Although the PoF anti-SLAPP motion alleges that the airshow is protected speech, airshows and similar events are not the usual focus of anti-SLAPP motions and their jurisprudence. Maybe it’s that California court rules require that anti-SLAPP motions be heard within 30 days after filing if possible. Perhaps the idea is to get a hearing on something other than the injunction prior to the dates for the show. Given that the court has slated other motions for hearing on 9 May, PoF argues that the court has room on the docket and must hear the anti-SLAPP motion earlier than the scheduled date (by 19 May in any case). Nevertheless, there’s no guarantee that the hearing would happen before the 6-7 May dates for the 2017 airshow. Long story short, PoF is asking the court to hear all of PoF’s motions on the same day. Being that the earliest of the presently-scheduled PoF motions is set to be heard on the second day after the 2017 Chino Airshow wraps, there’s no obvious effect on the 2017 airshow itself from the consolidation. But it might signal thoughts by PoF that it believes that it has a pretty strong case and wants to bring all of the motions together to concentrate firepower in one hearing. Generally speaking, if a party thinks that it’s a little thin on the law, the facts, or both, it makes sense to scatter one’s motions around a little to divide and conquer, or at least fight an effective rear-guard action. PoF is doing the opposite. Could the ex parte application mean something else? Of course. But that’s the view from here in the cheap seats. Lastly, by all indications that we can see from the docket, the motion on the preliminary injunction is still set for 28 April. Nothing new to upload today. If I’m reading the docket (reproduced above) correctly, it looks as though the hearing on the injunction was adjourned for a week or longer. The docs themselves are not available and you’re seeing everything that we are without calling the clerk to get an explanation. We might do that early next week. In any case, if we had to guess, we’d guess that the parties are huddling to see if there’s a way to settle this out of court (which would be among the results most likely to result in the 2017 airshow happening on schedule). So we’re cautiously optimistic. Stay tuned. All pleadings through mid-day 17 April 2017 (the whole megillah). 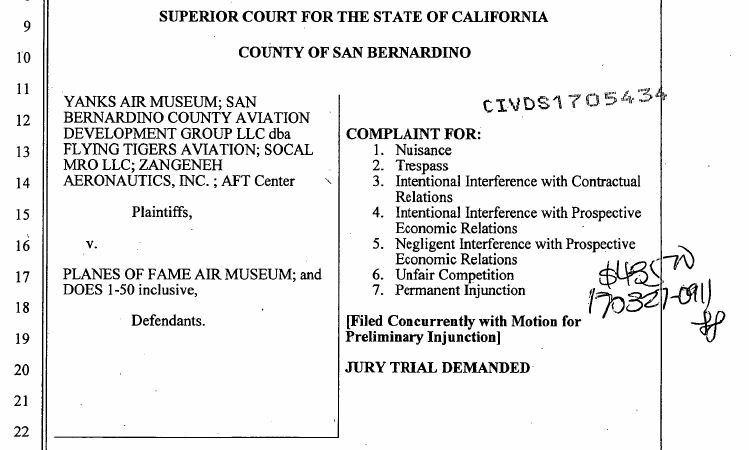 Pleadings filed by Planes of Fame on 7 April in opposition to the injunction. Neither this post or anything else short a of a formal engagement letter creates a lawyer-client relationship between Steve Tupper or his law firm (on the one hand) and you (on the other). The materials are provided with no representation, warranty, guaranty, or other promise of any kind and we might or might not update this page. Use these items at your own risk. Airspeed has dropped maybe $150 with the court in order to download the pleadings. If you feel like slipping Airspeed some money, you can do it by hitting the “Donate” button on the right-hand side of this page. Any excess received will be squandered on aviation activities and/or donated to the Tuskegee Airmen National Historical Museum in Detroit. The lawsuit in San Bernardino County, California is heating up. I’ll be on Warbird Radio Live tonight at 8:00 PM US ET (2000 US ET/0000Z) to talk with Matt Jolley about recent developments in the case from a lawyer’s perspective. 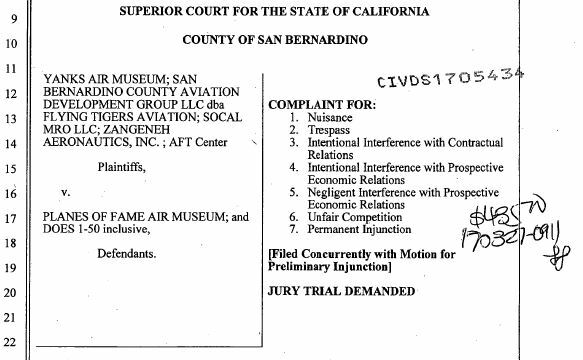 As many of you know, Yanks Air Museum and several other tenants at the Chino Airport (KCNO) have sued Planes of Fame Air Museum, claiming trespass, three flavors of interference, and unfair competition, and have sought an injunction that would prevent the Chino Airshow from occurring. In a nutshell, Yanks and the other plaintiffs claim that the airshow limits their ability to do business and, among other things, they’ve asked that the court enjoin Planes of Fame from conducting the airshow. For those following along at home, here are links to the pleadings so far. These are public court documents. Tune in tonight! You’ll get my perspective as an aviation lawyer, airshow performer, and air boss, as well as the views of other callers and guests – all moderated by Matt Jolley, a real and experienced airshow announcer, pilot, and Edward R. Murrow award-winning journalist.